LAME 3.93 is one of the most popular MP3 codecs. We used the one from SMPMAN. It's one of the fastest though it's not that popular among Windows users as the version from MP3-Tech.org. The GOGO 3.12 is less popular but it's also a very efficient and well optimized MP3 codec (it supports MMX, 3DNow!, E3DNow!, SSE, SSE2 instruction sets and SMP systems). Unfortunately, the developer makes available only source texts, and the version we used before can now be downloaded from our site. The OGG coder is a dynamically developing and efficient OGG Vorbis format from the Vorbis Tools 1.0.1. This standard delivers high audio quality at a relatively low bitrate; besides, it's open and free. We shouldn't forget about Microsoft's formats, and the one we selected is Windows Media Audio (latest 9th version); it works in two modes: VBR (by the way, the Windows Media Encoder 9 is the only software that we know that supports two-pass (!) 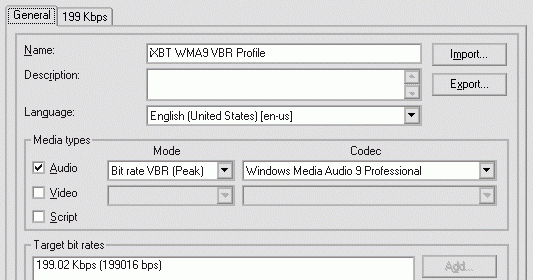 VBR audio encoding), and Lossless Compression. It was much simpler to choose options for the GOGO as it's based on the LAME code. So, we took the same settings, except minor details (small "v" instead of the capital one, and one minus instead of two before "silent"): <-m j -q 0 -v 4 -silent>. The speed and the size are as expected different as the code wasn't just copied. The OGG Vorbis codec has one interesting peculiarity - in case of the default encoding it works in the VBR mode (or it's rather closer to ABR). The developers recommend setting the desirable quality instead of the bitrate. We followed their advice, and now the options look even simpler than before: <-q 5 --quiet> - average quality and no diagnostic messages. The test script and the respective software which allow measuring the compression time automatically with all the codecs described above can be downloaded free of charge. The distribution packet (one bat file and several executable) includes the EXE file in the form of a self-extracting 7-zip file. When started, it can be unpacked into any directory, into the folder named audio. The root directory gets !audio.bat which, if started without arguments in the command line or with arguments unknown to the script, displays information about them. The distribution packet doesn't contain the following software. First of all, it doesn't include the test WAV file because you would hardly be glad to download the test technique with this weighty 146MB WAV file. Besides, it might overload the server if there are too many users willing to download it. But if you want to place this file on your own server and make it freely available, email us. We can suggest that you make a WAV file entirely identical to ours yourselves: just grab from an audio CD the composition named "O`malley`s bar" from Murder Ballads album (performers are Nick Cave & The Bad Seeds). 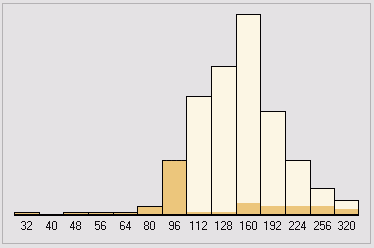 In our case at the sample rate of 44100 Hz and 16bit sampling the file is 146 MB (153275180 bytes), the play time is 14 min. 28 sec. Otherwise, you can just place into the root directory (where !audio.bat is) any WAV file of the PCM format and name it TEST.WAV. The results will hardly be the same even if the hardware coincides, but if you want to compare different systems, the outcome and conclusion must be the same. However, some believe that contents of the source file also influences the speed - well, if someone proves it, it will be very interesting to us to know the details. The distribution packet doesn't include the Windows Media Encoder 9 required for testing the Windows Media Audio encoding performance (only for these tests!). You can download it yourselves - it's freely available on the Microsoft site. You can change settings of the Windows Media Encoder at your own risk, but we didn't change any, that is why we do not guarantee flawless operation of the script in other cases. All other codecs are included into the distribution packet in the version necessary for running the tests. ...If you are interested in the script source texts and commands, we will briefly explain functions of some utilities and some operations in the script which do not look obvious. Contig is a freely available defragmentor which allows defragmenting certain files and/or folders and it runs from the command line. Although this Mark Russinovich's utility is pretty old, it successfully works even in the Windows XP. Contig uses standard functions of the Defragmentation API of NT based systems, that is why it's useless for the Windows 9x. We hope it's clear what defragmentation is needed for. Sync is another Mark Russinovich's utility and is an alternative of the well-known unix utility with the same name. Sync resets the disc cache and does it before the script "forcedly" caches useful information (see further about copy ... nul). Timer is Igor Pavlov's utility which measures time of operation of any program (the way it can be used is clear from the bat file). This is one of the best programs of this kind, it displays not only the running time but a lot of other useful information. copy test.wav nul caches test.wav before running the compression speed test so that it can be read quicker by the encoding program. It's necessary to weaken the influence of the disc subsystem on the outcome. The file is copied to nowhere because copying doesn't matter - what is important is to have the file read before starting the test. While the test is running no encoded files are created, because the encoders are output to nul in order to lessen the effect the disc subsystem has on the outcome. If you are interested in the real outcome just replace nul with a certain file name in the respective script line. Timer (in the logs) reminds Process Time = 66.296 = 00:01:06.296 = 128% i.e. it indicates that the process time exceeds the overall time of the program execution, it testifies that you have an SMP system and the application has created several streams. In this case you can see the total time of execution of all streams, and if there are more than one stream, the time exceeds 100%. Such situation is typical of GOGO and Windows Media Encoder on systems based on two CPUs or on the Pentium 4 + Hyper-Threading because these application can use more than one CPU. Undoubtedly, we are interested in your testing this packet. And we welcome all facts about bugs, errors etc., as well as your suggestions about options, software, versions etc. But do not expect all errors to be corrected at once, because the test packet is meant primarily for testing audio compression performance in our lab, and the most important for us it to have this packet running correctly in our lab. It doesn't mean we refuse to provide support, but it will depend on the workload we have. Anyway, you use this script at your own risk and we are not responsible for the outcome (though we do our best to prevent any problems). Here you can always find news, changes and updates. Of course, everyone can use it. But if you decide that it's simpler to use a finished program than to develop your own software, you should mention the developer's name - iXBT.com. Firstly, you express your thanks, and secondly, it can be useful for the readers as they can always compare a lot of results obtained within the open test technique by us, you and the readers themselves, and for that they must know what technique is used. The only limitation is that we do not recommend making the test packet available for download on your own sites - you'd better give the link to the official support page. Undoubtedly, there will be bug-reports and suggestions about modification of the test technique, that is why it's better to let everyone have the latest version.